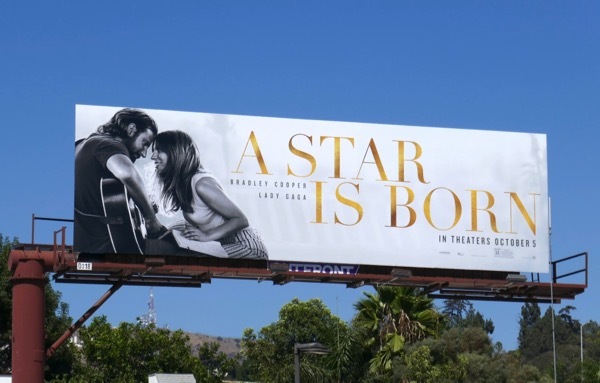 A Star Is Born is Bradley Cooper's directorial debut and it's a fitting vehicle for Lady Gaga as she's proven over the years that she's more than just a meat dress-wearing flash in the pan, enjoying enduring success in music, on television in American Horror Story and now on the big screen. 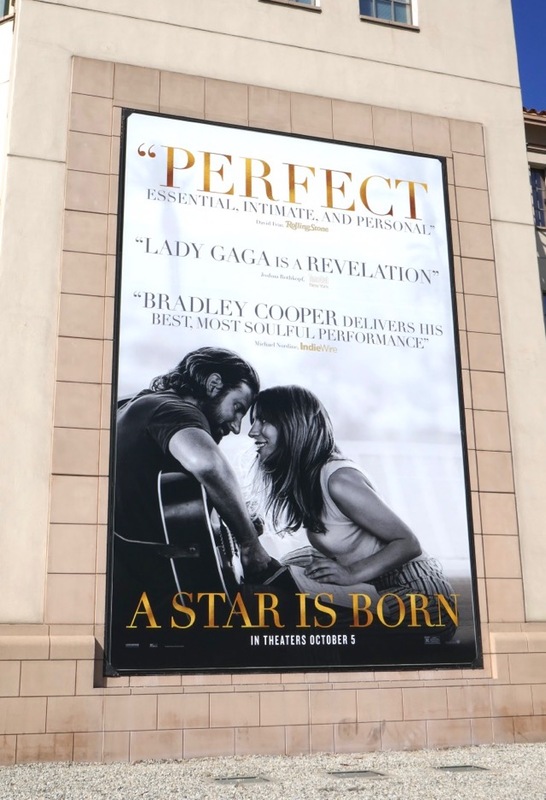 In this third remake of the original 1937 film which starred Janet Gaynor and Fredric March, Bradley Cooper plays a hard-drinking, veteran musician who discovers and falls in love with a talented, struggling young singer (played by Lady Gaga) bringing her into the spotlight, even as his own star starts fading due to his age and internal demons. To help make the film more timely and resonate with today's audiences, compared to the other 1954 musical with Judy Garland and James Mason and 1976 rock musical with Barbra Streisand and Kris Kristofferson, portions of this version of the romantic drama were filmed at Coachella and Glastonbury Festivals for authenticity. 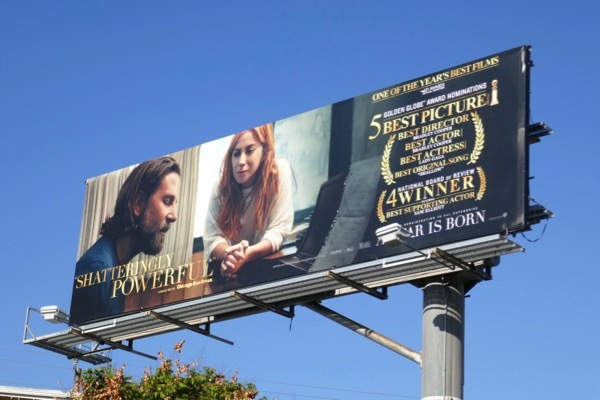 These movie remake billboards were spotted along Sunset Boulevard, Cahuenga Boulevard, Ventura Boulevard and Santa Monica Boulevard from August 22 to September 27, 2018. 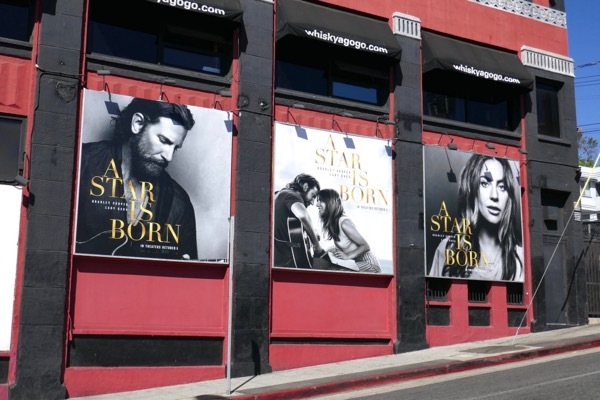 Fans of Bradley Cooper can also check out these billboards for The Hangover movies, these American Sniper movie billboards and these American Hustle movie billboards, to name but a few. 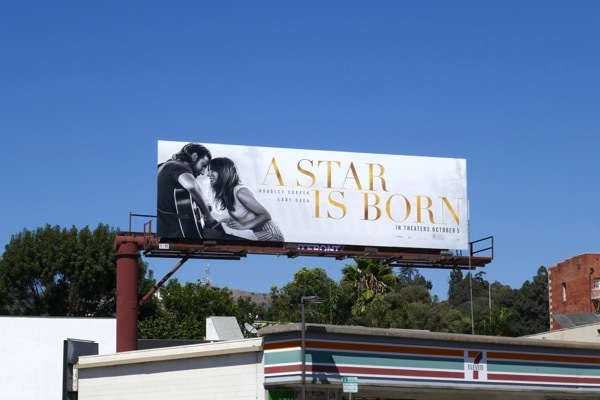 Meanwhile Little Monsters can enjoy all these Lady Gaga music, documentary and fragrance billboards filling the city skyline in recent years. 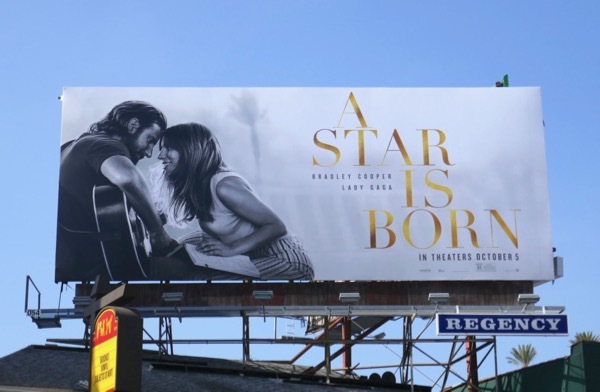 We already knew that these two were talented, but their on-screen chemistry and connection in front of and behind the cameras will probably ensure that their stars will continue to shine for years to come. 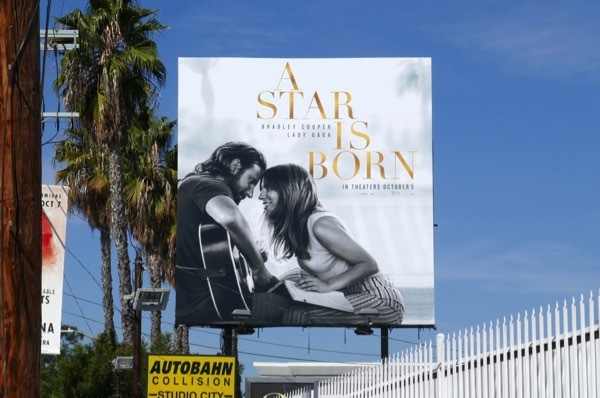 UPDATED: Here's also a review-laden billboard for the movie spotted at Warner Bros. Studios on October 12, 2018. 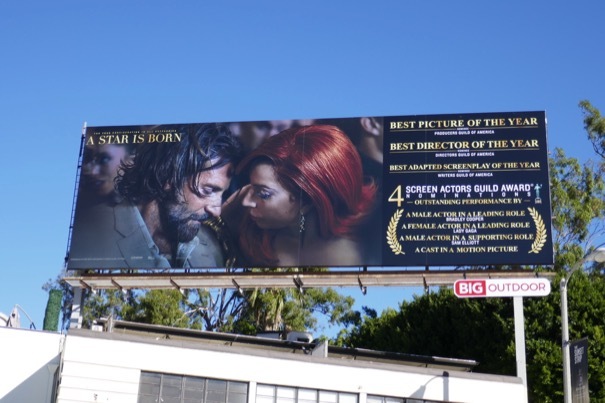 UPDATED: Congratulations to A Star is Born for garnering five Golden Globe nominations including for Best Motion Picture - Drama, Best Actor and Director for Bradley Cooper, Best Actress for Lady Gaga and Best Original Song for 'Shallow' written by Lady Gaga, Mark Ronson, Anthony Rossomando and Andrew Wyatt. 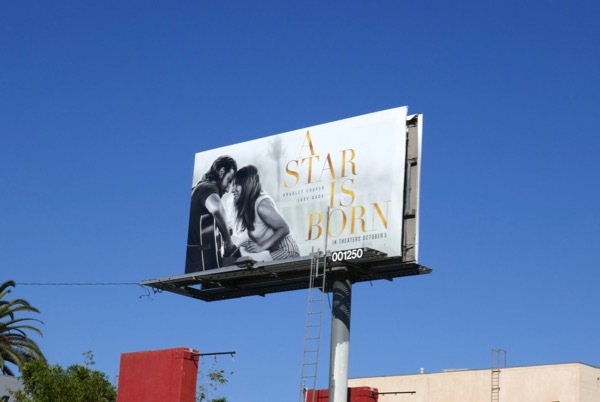 This 'For your consideration' billboard was spied above Pico Boulevard at Beverly Drive on December 21, 2018. 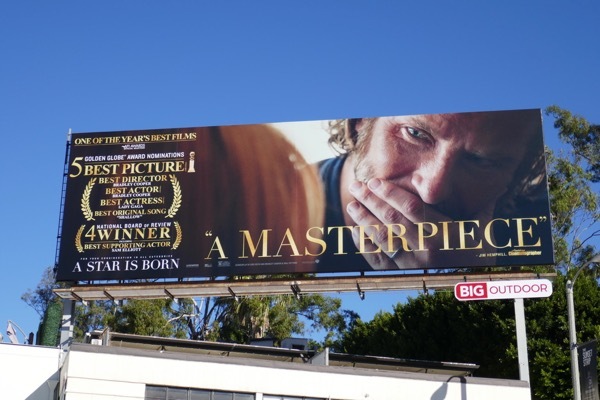 UPDATED: Here's another awards campaign billboard for the movie remake spied along the Sunset Strip on January 1, 2019. 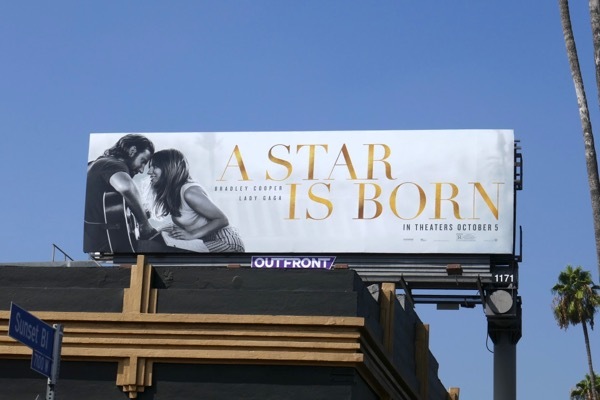 UPDATED: Here's also a fun awards season billboard for the movie featuring Lady Gaga as 'Ally' in a billboard location next to the Chateau Marmont Hotel from the film. 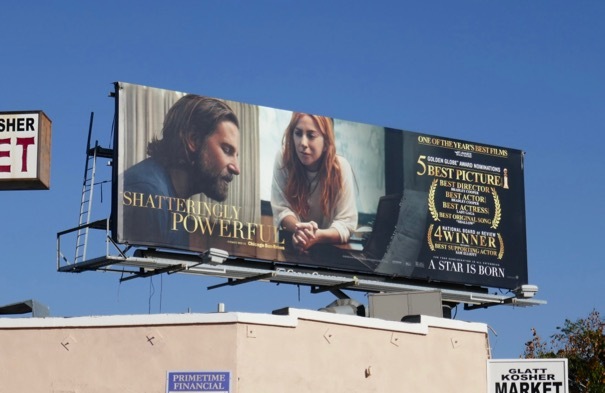 This clever PR worthy billboard was snapped along the Sunset Strip on January 5, 2019. 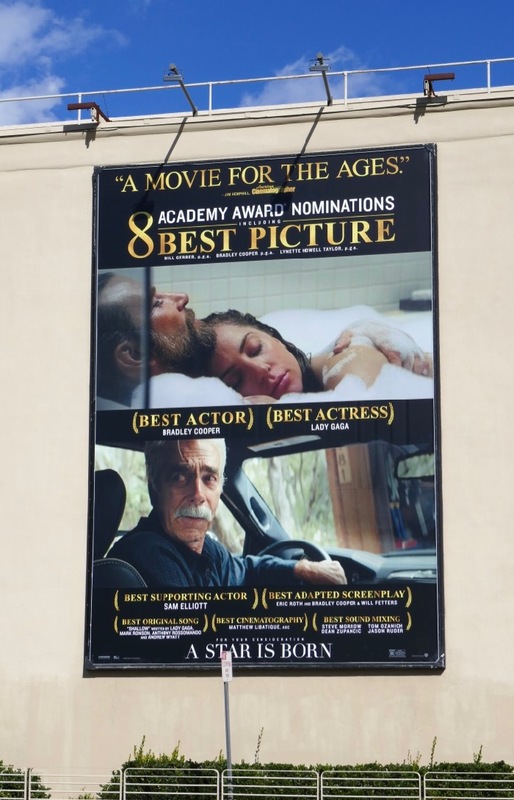 And here's also another consideration billboard spied along La Brea Avenue on January 9, 2018. 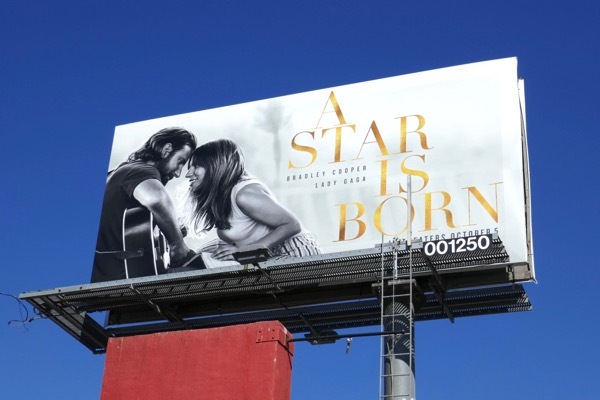 UPDATED: Congratulations to Lady Gaga, Mark Ronson, Andrew Wyatt and Anthony Rossomando for their Golden Globe win for the song 'Shallow' from the film. 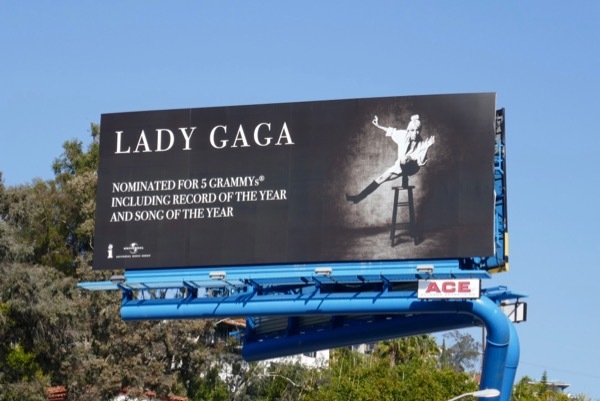 Here's some extra support for Lady Gaga from her record label for her Grammy-nominated song, snapped high above the Sunset Strip on January 10, 2019. 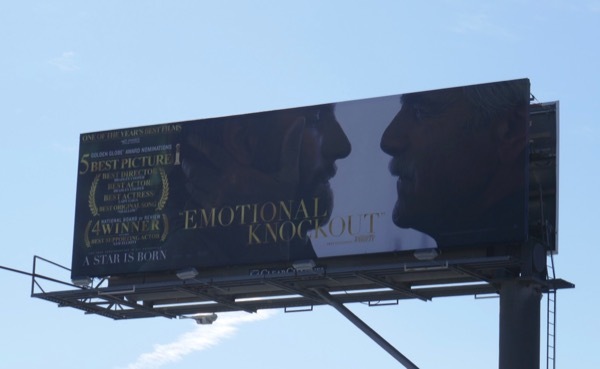 UPDATED: Here's also a consideration billboard for the film's four Screen Actors Guild Award nominations snapped along the Sunset Strip on January 19, 2019. 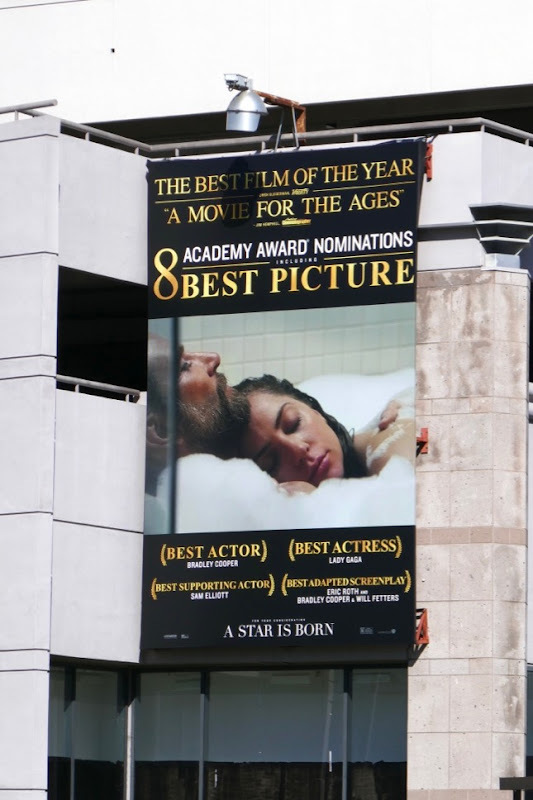 UPDATED: Congratulations to this version of A Star Is Born for landing an impressive eight Oscar nominations. 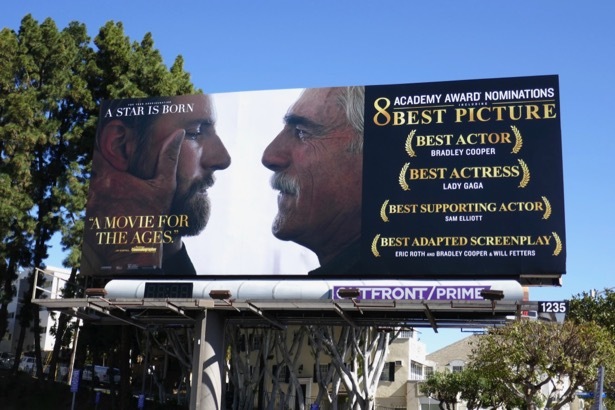 The film is not only up for Best Motion Picture, but also Best Actress for Lady Gaga, Best Actor for Bradley Cooper, Best Supporting Actor for Sam Elliott as his on-screen brother, Best Original Song for 'Shallow', Best Adapted Screenplay, Best Cinematography and Best Sound Mixing. 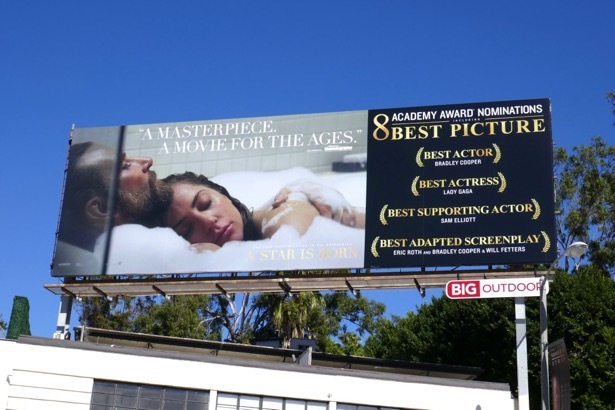 These Academy Award nominee billboards were spotted along the Sunset Strip and La Cienega Boulevard for your consideration from February 3 to February 6, 2019. UPDATED: Here's another portrait ad creative spied at Warner Bros. Studios in Burbank, California on February 18, 2019.